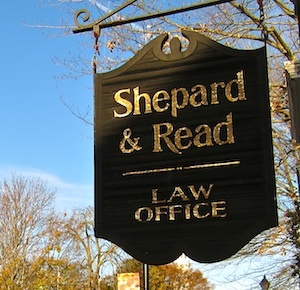 Shepard & Read is a generalized law practice with a focus on real estate, from transactional matters to land use and permitting to litigation. We have a full time real estate paralegal who handles our closings and we pride ourselves in being highly responsive to clients and customers at all levels. Our firm represents several municipalities in York County and the attorneys have appeared in front of local boards in virtually every surrounding town. We have undertaken a considerable amount of real estate litigation over the years, including boundary disputes, right of way cases, paper street and legal partition matters. As a general practice firm, both attorneys have assisted numerous clients over the years in preparing wills and other related estate planning documents. We also have a large inventory of family and individual business corporations, limited liability companies, and other business entities which we have formed and for whom we serve as Clerk and Registered Agent. Finally, the firm also handles divorce, OUI, personal injury, foreclosure and general civil litigation matters. We have also served as mediators. We believe that we can assist in providing whatever legal services a client might need. To the extent we need to partner with a larger firm on specialized matters, we have a number of resources at our disposal. By profession we are called “lawyers” or “attorneys”, but the term we feel most accurately reflects our practice is “counselors.” We are professional problem solvers. Our experience, along with our personal style of communication provide what our clients need: honest and realistic assessments of legal problems with efficient and effective resolutions.